Congratulations to Smashwords author G.J. Walker-Smith. Apple today named G.J. 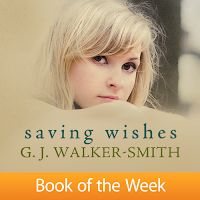 's free series starter, Saving Wishes, their Book of the Week in the US and Canada iBooks stores. The title is receiving prominent front-page promotion on iBooks for the next seven days. The timing is great for G.J. because the third title in her series, Storm Shells, has been on preorder at Apple for over two months and is set for a release of November 11. Based on its accumulated orders prior to today, it already had a high probability of hitting #1 at several of Apple's iBooks stores around the world when it goes onsale. This week's Book of the Week promotion will only help because she still has another couple weeks to accumulate more orders. G.J. provides Smashwords authors a great mini-case study on how to leverage the iBooks store to reach thousands of readers. iBooks is now the world's second largest global ebook retailer, and it offers a wealth of merchandising opportunities for savvy authors. How does an author get selected for such merchandising love? It's not easy, but as I describe in my new iBooks Merchandising workshop viewable now at YouTube, there are a number of things Smashwords authors can do to maximize their odds. The merchandising team at Apple has over 2 million books to choose from when selecting their Book of the Week, which means the odds of any one title receiving such merchandising love is extremely rare. With only 52 weeks in the year and so many books to select from, the odds of any one title being selected is about 1 in 50,000. Yet multiple Smashwords authors have already been selected. One of the great things about Apple's selection process is that it's merit-based. The titles they select have earned it, often by implementing many of the best practices I so often encourage our authors to adopt (click here for my video workshop on best practices). In G.J. 's case, she made a number of smart moves, each of which contributed to her selection for this promotion. 1. List *all* your books on Apple - This is a no-brainer and should go without saying, yet many authors don't yet have their books at Apple. If your titles are locked up elsewhere, such as in KDP Select's exclusive program, you're missing out on the world's second largest ebook selling platform. Millions of customers only shop at Apple iBooks. It's important to have your entire list at Apple. If you have an incomplete collection of books at Apple, they're less likely to promote your books. Smashwords makes it fast, free and easy to get your books listed at all 51 of Apple's iBooks stores. G.J. has all her titles at Apple distributed via Smashwords. 2. Write a super-awesome book that delivers extreme satisfaction to readers - G.J. 's books get "WOW" reviews at Apple. Apple's customers love her. If you earn the attention of Apple's customers, you'll maximize your odds of gaining the attention of Apple's merchandising team. 3. Great covers - G.J. has beautiful, professional-looking covers. There's a consistent design theme across the covers, which helps unify the series. Your cover is the first impression you make on a reader. A poor cover chases readers away. A great cover invites them in. 4. Leverage FREE - Saving Wishes is a free, full-length series starter clocking in at over 100,000 words. It's only been published since May, but because it's FREE it helped her build a massive following with Apple customers worldwide in a short period of time. When you price at free, you eliminate the financial risk readers must take when they purchase a book from an unknown author. In other words, you eliminate a key friction point that might prevent a reader from giving you a chance. By giving the reader a full-length series starter, G.J. has over 100,000 words through which to earn the reader's trust. By the end of the book, G.J. has earned the reader's trust with her writing. The reader is emotionally invested in the characters and story, and they're more likely to purchase the next books in the series. And that's what's happening. 5. Leverage preorders - G.J. followed the recommended best practices for doing a successful preorder with her forthcoming book 3, Storm Shells. When Smashwords launched our new preorder distribution feature a few months ago, I encouraged authors to allow at least 1-2 months preorder runway. She gave the preorder ample runway - in this case over two months - to accumulate orders. With a free series starter driving sales of book 2, she had both book 1 and book 2 working for her this entire time to drive orders to Storm Shells' preorder. A preorder allows the author to capture the reader's order at the moment they have the reader's attention and interest - right when they finish another book of yours and want to read more! Thanks to the high number of accumulated orders for Storm Shells, it gives Apple increased confidence that their customers are excited about her books, and therefore gives Apple greater confidence to promote the book and the author to a broader audience. Preorders give retailers yet another reason to promote your book. These five items above can't entirely capture the multi-faceted factors that drive the selection process at Apple. View my Apple merchandising workshop for more tips. Most authors will never receive this kind of merchandising love, though I can tell you that the mere process of working to earn and deserve such merchandising promotion will help your book become more successful. If you implement best practices, and take full advantage of the talent and tools you have at your disposal, you will reach more readers, even without the boost of merchandising love. I've written before about my concept of Viral Catalysts. A Viral Catalyst is anything that makes your book more available, more discoverable, more desirable and more enjoyable to readers. Viral Catalysts drive word of mouth. Key to the Viral Catalyst concept is that there's no single magic bullet that helps an author become a bestseller. A successful author must do many things right, while avoiding mistakes that can undermine success. If you'd like to learn more about G.J. Walker Smith, check out her Smashwords Interview. Congrats to GJ and Smashwords. Kudos to Apple for recognizing a great book.